Jobs and the city. Employment in US metros over 1 million population, Aug 2016 – Aug 2017. 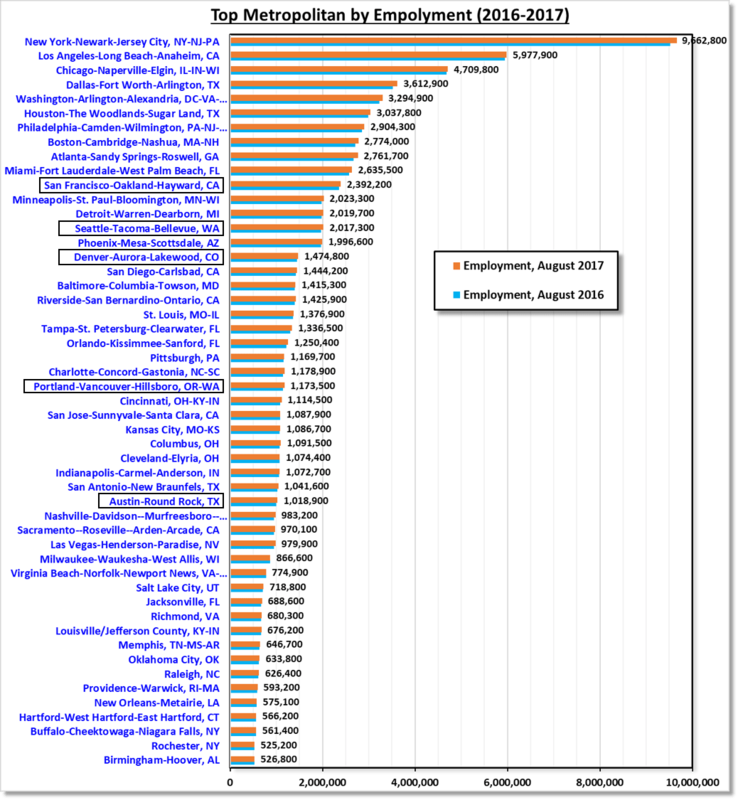 Employment for biggest metro in US with population of over 1 million. As the biggest US metro, New York offers the highest number of jobs at 9.6 million. LA, Chicago & Dallas as the next biggest biggest cities follow the employment. However, Washington DC has more jobs than Houston despite having smaller population. The overall growth in these 48 cities is about 1.8% for past 12 months. The fastest growth has been in Raleigh, North Carolina (3.5 percent), Orlando-Kissimmee-Sanford, Florida (3.3 percent), and Atlanta-Sandy Springs-Roswell, Georgia, and Las Vegas-Henderson-Paradise, Nevada (3.2 percent each). The metros that showed a decrease in employment are Virginia Beach-Norfolk-Newport News, Virginia-North Carolina (−0.6 percent), Milwaukee-Waukesha-West Allis, Wisconsin (−0.4 percent), and Rochester, New York (−0.3 percent). Portland, at 2.4 million has about 1.2 million jobs suggesting almost half of the population, including all family members, living in the city is working. Source: www.bls.gov – 12-month employment growth 3.0 percent or higher in 6 large metropolitan areas, August 2017.